Infinity™ Series - With maximum efficiency, the Infinity Series heating system offers the highest level of options and heating comfort. With the most complete level of user controllability, this heating system even detects and notifies you when in need of air filter replacement. The Infinity Series heating system is the highest in excellence that Carrier has developed for your home. Performance™ Series - All the features of the Comfort Series and more. Offering even higher efficiency, the performance series heating system provides a wide variety of upgraded heating products for a comfortable home. Comfort™ Series - Best in the industry at a super consumer value. Offering a high level of efficiency, the Comfort Series heating system is the high quality, value heating solution for a comfortable home. 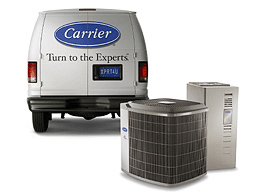 Carrier's Infinity 18 central air conditioner with Puron refrigerant and two-speed technology delivers excellent efficiency, reliability and proven performance throughout its lifetime. Performance 14 Central Air Conditioner Carrier's Performance 14 central air conditioner is designed to use environmentally sound Puron refrigerant and electricity f or economical utility costs throughout the year. Carrier's Performance 13 central air conditioner is designed provide superior efficiency from Carrier's experts in home cooling. Carrier's Comfort 13 central air conditioner delivers the high level of comfort with dependable cooling now and in the future with durable construction and advanced reliability testing.